In the mid-Victorian period, when British international influence and power were at their height, concerns about local economic and social conditions were only slowly coming to be recognised as part of the obligations and expectations of central government. – at a price – the passing specific local Bills to address their needs. 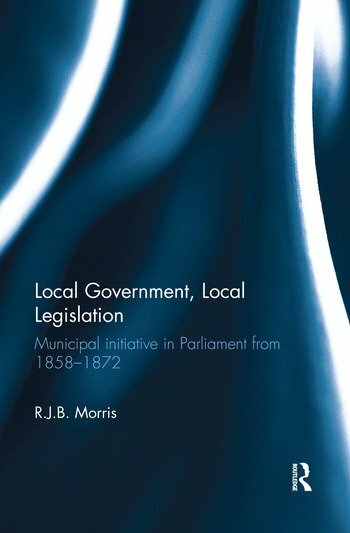 Identifying and analysing for the first time the 335 local Parliamentary Bills promoted by local authorities in the period from the passing of the Local Government Act 1858 to the first annual report of the Local Government Board in 1872, the book draws three main conclusions from this huge mass of local statute book material. The first is that, far from being an uncoordinated mass of inconsistent, quixotic provisions, these Acts have a substantial degree of cohesion as a body of material. Second, the towns and cities of northern England secured more than half of them. Thirdly, the costs of promotions (and the vested interests involved in them) represented a huge and often wasteful outlay that a more pragmatic and forward-looking Parliamentary attitude could have greatly reduced. Dr R.J.B.Morris, O.B.E. is a retired local government Chief Executive and lawyer with over 40 years’ interest in local legislation.